This imaginary composition was inspired by the natural grouping of sharp peaks hewn from a large feather rock boulder. The spirit captures the rocky shorelines of Southeast Asia. The Korean tray, a casting of 85% mica and graphite, is hand burnished but otherwise unfinished. 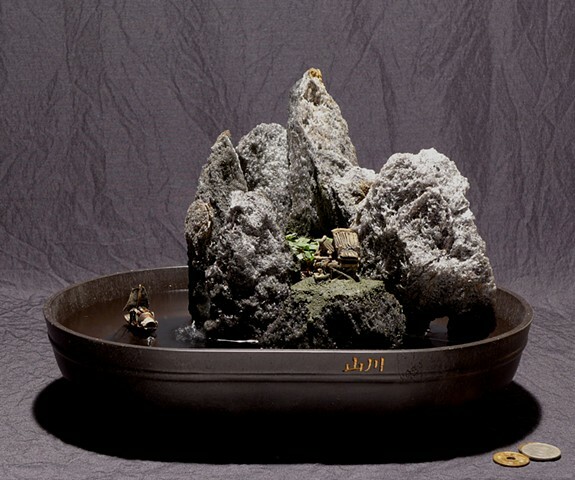 Below the lip of the tray are the Chinese characters “shan" and "chuan" (mountains and streams).